From a conversation on the Commons Abundance Network. Of course I agree a lot is solved by having it clear what you are using the word “growth” to refer to. But it’s easier to figure out we *should* be clear about what is being referred to than to really do it. It’s so easy to fall into the trap of treating some “positive indicator” as the system, some changing number that “sounds nice” in name, to end up promoting something not knowing what the real situation is at all. That’s exactly how the BAU approach to consuming the planet ever faster got off track, using a trusted set of indicators and not paying the least attention to how their meanings were changing radically over time. So, that philosophy’s “mistake” was not paying attention to the whole system it was applying its values to. False priorities develop are all over the place that way. Giving relief wherever there is pain and suffering, for example, ignores that injecting artificial supports just skews the indicator. It changes the ability of people to care for themselves in the wrong way, giving them dependencies rather than independence, and directly causes their own local cultures to become useless to them and decay. So, the question is “What else needs to be said?” when observing “the material needs of the poor” could be satisfied “with just a little of the excess consumption of the rich”. Well, one thing is “Oops… that seems to be a mistake, actually.” Disrupting the economies of the poor with gifts from the rich wouldn’t really help much. It wouldn’t help the rest of us become any wiser either. Somehow a lot more understanding of the problem, and of what originally disrupted their cultures seems needed. One metaphor I’ve had for this problem, for years, is “painting over your picture window”. If you have a window for viewing the complex world around you, and see something simply beautiful, might you be tempted to paint a mural over the window to preserve the vision?? I finally discovered a way to avoid that temptation, and save myself all the false starts and blind searching it takes to keep opening up a new windows after painted over them so I can’t see out of my own world of pretty pictures! It took a lot of trust, that if I keep my window clear what I’d be looking at would at least be real, and on enough days it’d be something totally new and simply beautiful. In nature “growth” isn’t about changes in some indicator with a + or – value attached. It actually refers to the organizational development of changes throughout a whole system, that during its start-up “growth period” are identified by the burst of energy use for the spreading expansion in a viral fashion of the network of relationships that is bursting into existence as it grows. So a “growth indicator” is a ‘tag’ linking you to an evolving future for something you’ve been monitoring in the past. It’s not a “number” but a tool to use in a learning process about an independent living organism of some sort emerging in your environment. The number tells you no more about the subject than a person’s height and weight would tell you about a friend’s life, unless you’ve been staying up to date on the rest of what’s happening too. 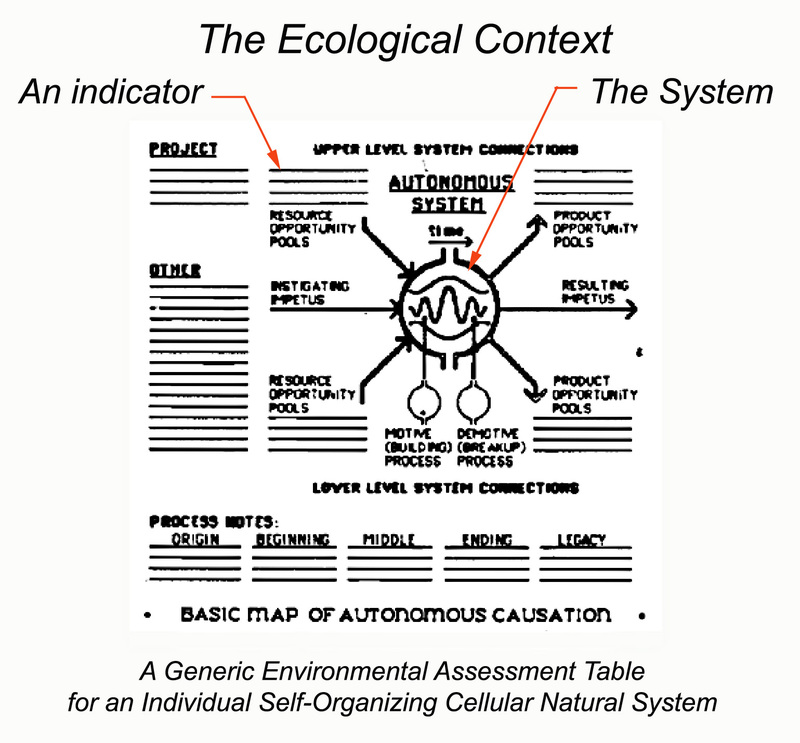 Indicators are only meaningful if they help you think clearly about what’s happening within the growing system as a whole and to its interactions with its environment. Because growth indicators can change meaning so quickly, and without notice, one really has to keep your eye on a sort of general whole system view, to see if the same meaning you’ve been relying on is still there.